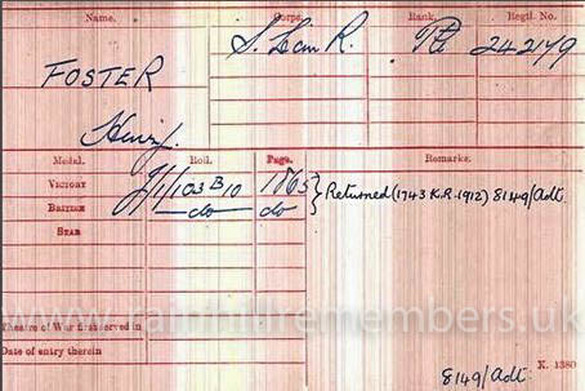 Henry Robert Foster was born in Rainhill in 1886. He was the eldest son of Peter and Margaret Foster, who at various times lived in Kemble Street and Seddon’s Brow, Prescot and Portico Lane, Eccleston Park. At one time, his father had been a publican in Prescot, his mother, a domestic servant, while he was a joiner. He enlisted into the South Lancashire Regiment, 1st/5th A Company and was killed in action on 12th April 1918 aged 31. He is remembered on the Loos Memorial which commemorates over 20,000 officers and men who have no known grave, who fell in the area from the River Lys to Grenay. Fixed tablets line the walls, circular courts and three semi-circular apses on which are carved the names of those commemorated. His death is also recorded on the family grave in St. Bartholomew’s Churchyard which states "Pte Henry Foster, So.Lancs.Regt. Killed in action in France, April 12th 1918 aged 31 years". At a special ceremony at the Warrington Road Cenotaph on Sunday 3rd July 2016, Rainhill village dedicated a new plaque bearing the names of 17 men with Rainhill connections who perished during WW1. These men's histories were found during Rainhill Civic Society's research. Rainhill Parish Council funded the plaque and organised the ceremony with Rainhill Civic Society, our local Churches and the Royal British Legion. Henry Robert Foster is one of those names. 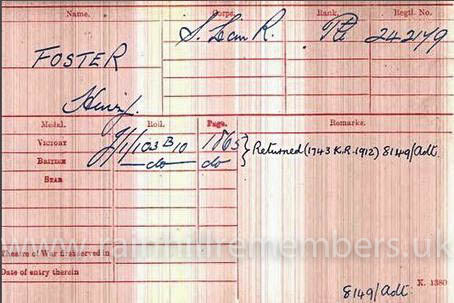 Henry Foster's Medal card showing that he was entitled to the Victory and British War Medal.